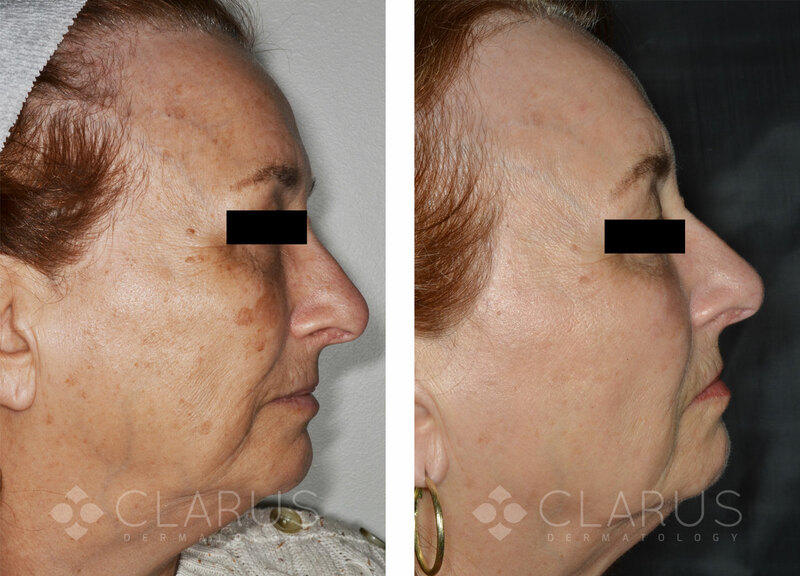 The following are before and after photos of real Clarus Dermatology patients. 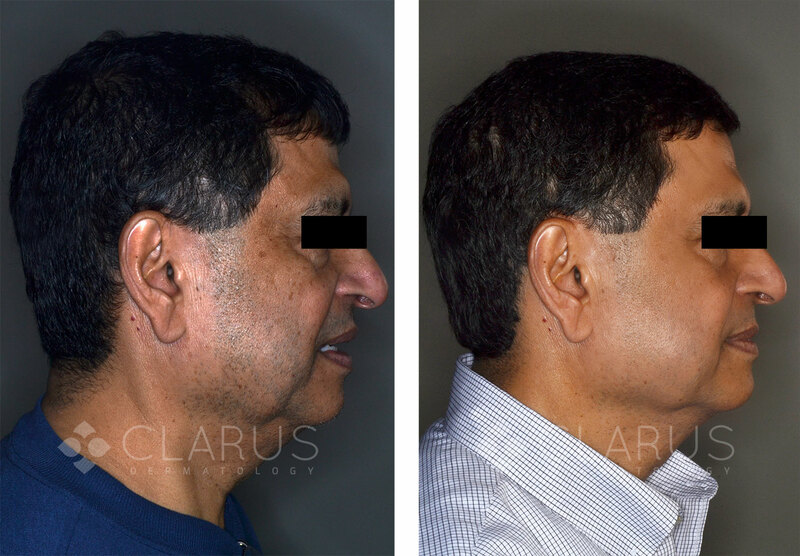 In this case our patient, a male in his 60s, desired a natural-looking improvement prior to his son’s wedding. 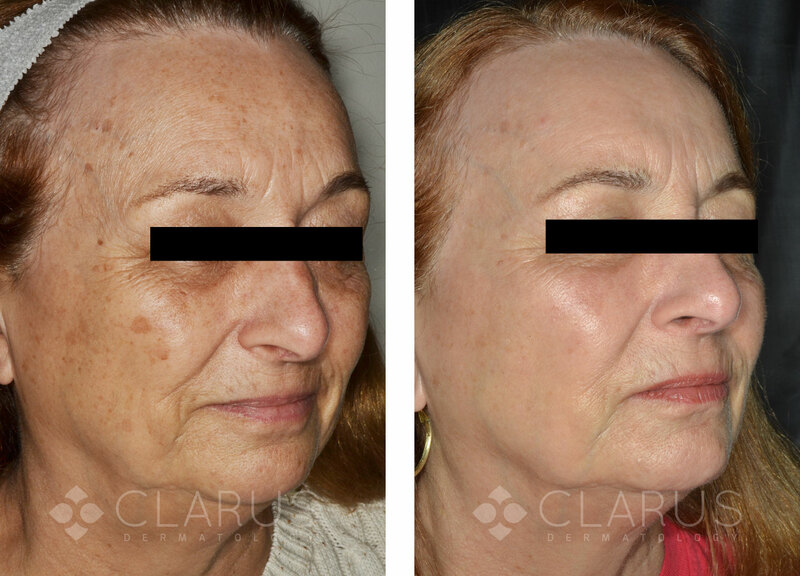 Several treatments were performed within a single “mega” session to reverse the signs of aging and sun-damage: full-face fractional carbon-dioxide laser resurfacing for sun spots and skin brightness, forehead fillers to improve brow position, cheek fillers to reduce jowls and midface volume loss, chin filler to balance the lower face and treat age-related mandibular recession, and full upper-face Botox®. The overall outcome is a fresh, natural, youthful facial profile that is still age-appropriate. 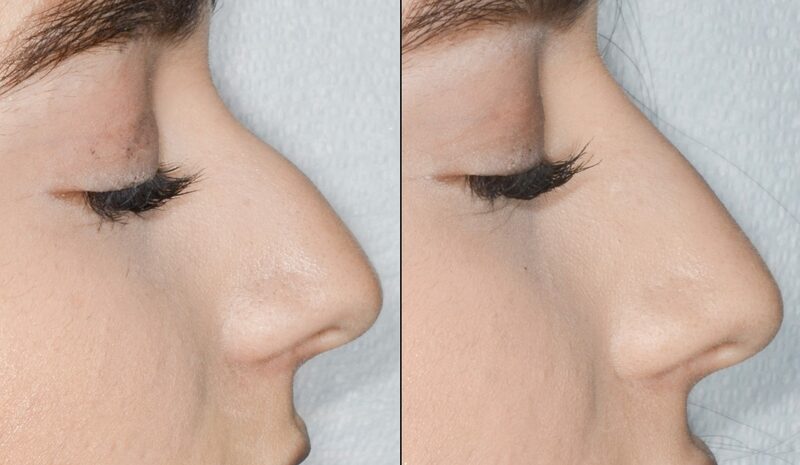 The patient desired an change in the contour of the nose without surgery. In one quick office visit the nasal contour was re-sculpted using Juvederm(TM) filler. There was minimal bruising, no downtime and immediate results. The filler should remain for 12-18 months in this location after which time treatment could be repeated. 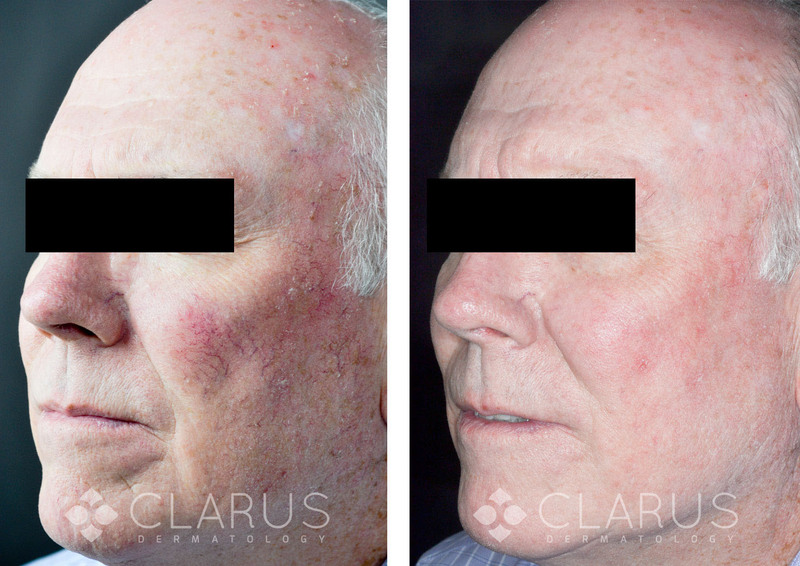 This gentleman desired improvement in the blood vessels from his rosacea. 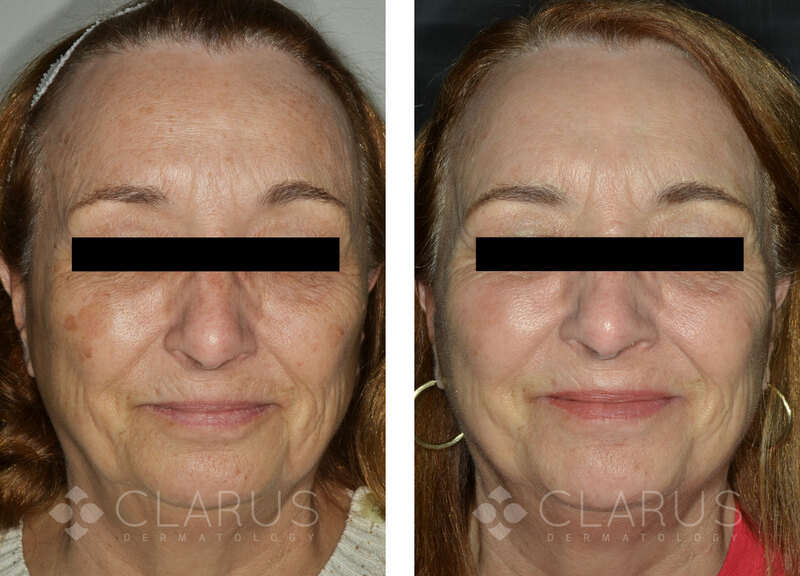 After one treatment with the elos PLUS device he saw a dramatic reduction in the redness on his face. 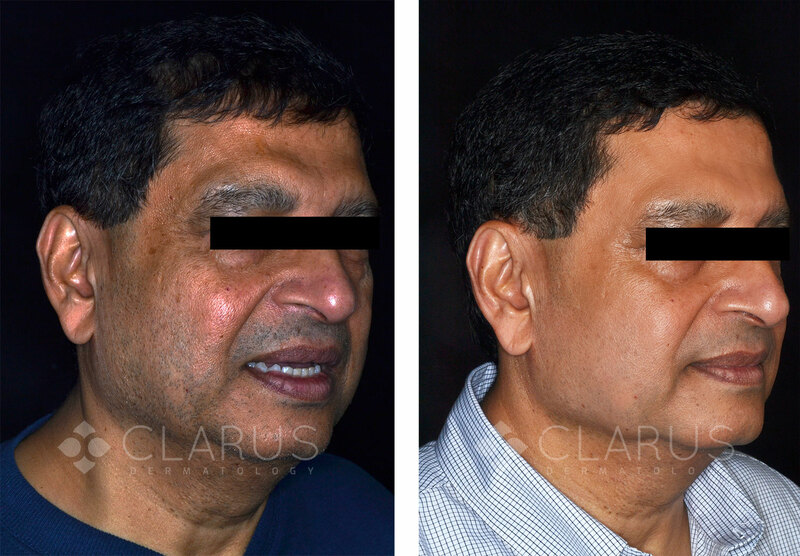 This gentleman suffered from long-standing phymatous change due to rosacea. 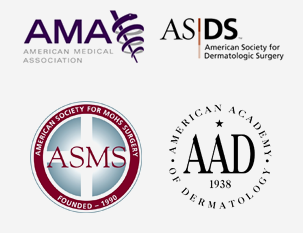 He was referred to our clinic by a prominent local dermatologist due to our expertise in laser surgery. 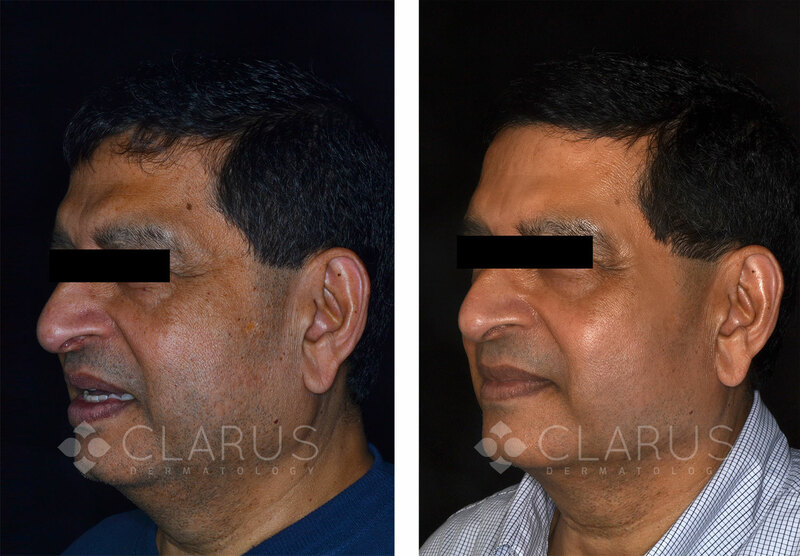 After one treatment he experience significant improvement in his phymatous change. In this case our female patient, an executive, felt that the spots on her hands made her look “old” when she would shake hands. 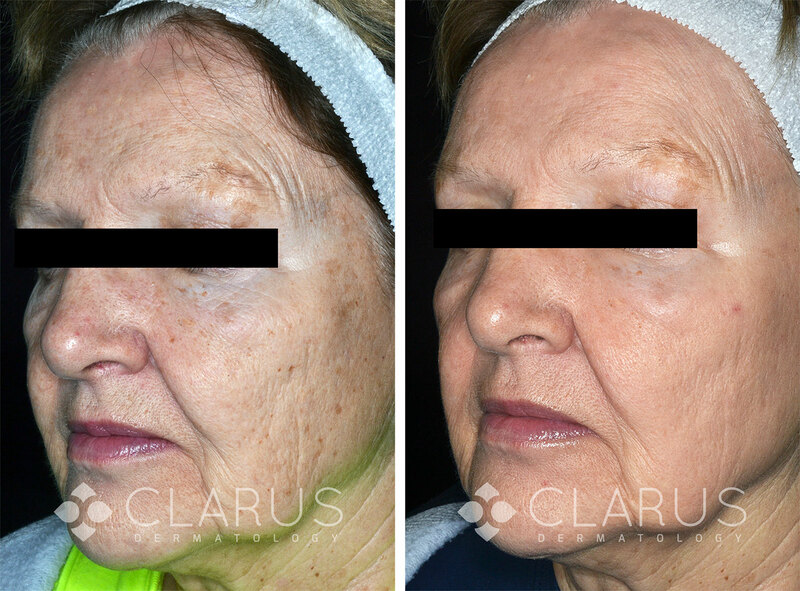 One treatment with the elos PLUS nearly resolved the brown spots (macular seborrheic keratoses) on her hands. Our patient desired reduction in the subtle brown spots on her chest so her skin would be clearer when wearing a lower-cut dress. A single treatment with elos PLUS resulted in a reduction in redness, number of sun spots and keratoses on the chest. This gentleman desired improvement in the blood vessels on his face. 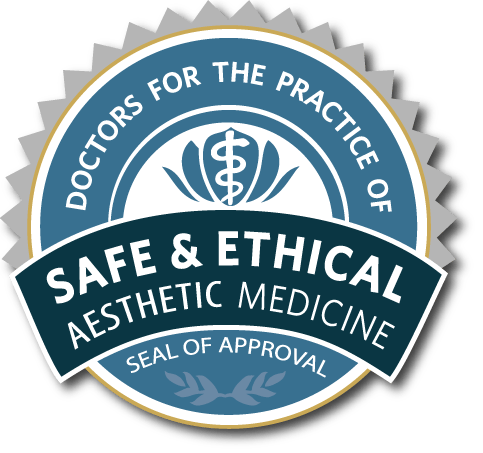 After failed treatments with medical spas he sought care at our clinic. 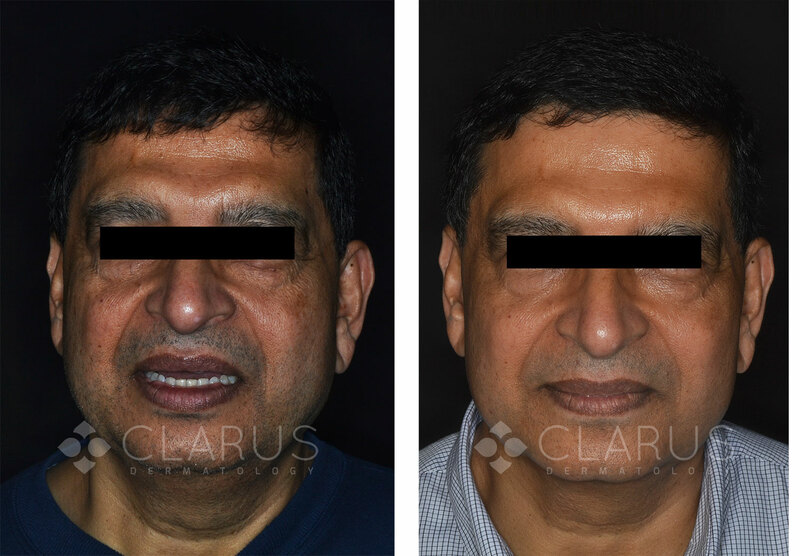 After one elos PLUS treatment session he saw a marked reduction in his facial blood vessels. A female in her late 60s desired improvement before a class reunion. 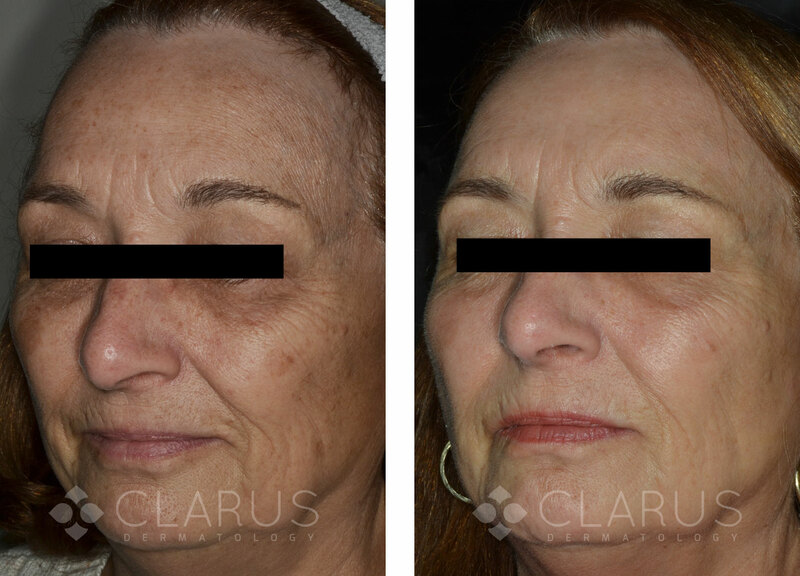 A single treatment, the Clarus Clear™ laser peel, resulted in a marked reduction in brown spots and a marked increase in skin luminosity. She was the star of the reunion. Our patient desired a rapid return to her pre-pregnancy appearance. A series of three combined treatments with Ultrashape and Velashape III led a rapid improvement in post-pregnancy abdominal shape. Our patient desired improvement in her abdominal fat before her annual trip to Cancun. A series of three painless, combined treatments with Ultrashape and Velashape III led a rapid improvement in her abdominal contour. A gentleman in his 40s who frequented the gym and controlled his diet well could not shed the last couple inches on his waist. A series of three painless, combined treatments with Ultrashape and Velashape III led a rapid improvement in his abdominal contour. A gentleman in his 30s who frequented the gym and controlled his diet well could not shed the last couple inches on his waist. A series of three painless, combined treatments with Ultrashape and Velashape III led a rapid improvement in his abdominal contour. A female patient in her 60s who maintained a vigorous exercise routine and excellent diet desired improvement in the ‘pouch’ on her lower abdomen. A series of three painless, combined treatments with Ultrashape and Velashape III led a rapid improvement in her abdominal contour.